Manufacturer Liebherr has unveiled the new LR 11000 crawler crane at Bauma 2013. The LR 11000 has a 1,000 tonne lifting capacity, a maximum lifting height of 222 metres and a maximum radius of 160 metres. The new crawler crane fits in the range between the LR 1750 and the LR 11350 and S type main boom and W type luffing jib allow a wide range of combinations. 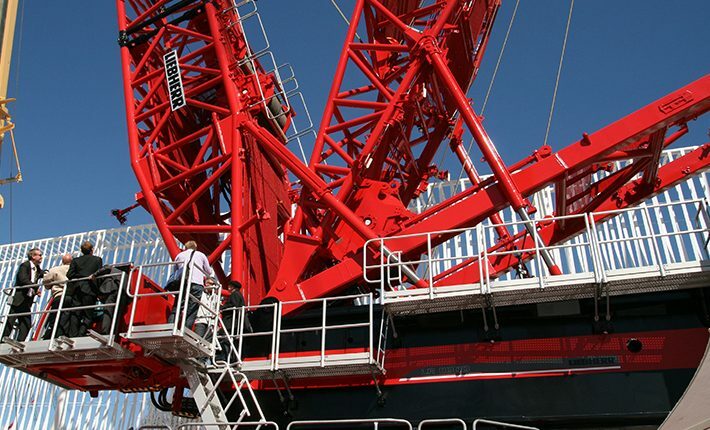 Features of the crawler also include the Power Boom system with a heavy luffing jib. The LR 11000 is prepared as standard for the P boom system, which has been taken from the 3,000 tonne capacity LR 13000. As a result, the main boom sections produce a particularly strong luffing jib, a company spokesperson said. The crawler operates with a maximum of 250 tonne slewing platform ballast, a 90 tonne central ballast and up to 450 tonne derrick ballast, which is fully adjustable. There is fall protection equipment and stacking supports for lattice sections. Power comes from a Liebherr V8 diesel engine which develops 500 kW (680 hp). Typical applications include handling offshore wind turbine components and foundation structures at ports, the manufacturer said.